This post comes from our presentation at Web Science 2012 this past June in Evanston, Il. We are in the process of preparing this study’s results for further conferences as well as a monograph. Along with producer Pooky Amsterdam of PookyMedia (whom I met producing earlier research ), we have begun a study to analyze case studies of amateurs and semi-professionals who have used virtual spaces, environments, and worlds to produce television programming. We are interested in virtual world television to understand the nature and potential of these productions, as well as how they relate to traditional practices and relationships in television production, distribution, and exhibition. In this paper we will outline (1) what we define as virtual world television, (2) what we see as the purpose for conducting this analysis, and (3) our method for conducting the case studies. We see this study as a first step to introduce to this user-generated, participatory form of transgression on traditional media norms. The rise of the Internet and Web 2.0 has facilitated the production of content by amateurs and semi-professionals to provide information and entertainment traditionally provided by media industries. This ability comes in part because of reduced production costs as the technologies of distribution are replaced by the Internet. With the rise of virtual environments – 3-D computer-generated spaces — production costs can be further reduced due to new technologies of production. Virtual world television (VWTV) refers to productions by amateurs and semi-professionals who would not be able to produce such programming in the physical world due to limitations such as cost. Virtual environments. There are virtual environments powered by game engines, and built chiefly to be confined to consoles, portables or computers for limited multiplayer functionality. Then there are virtual environments specifically labeled as virtual worlds [1, 8], whether they are worlds designed for gaming, for socializing, or for some combination thereof. For the purposes of our study, we are considering both types under the nomenclature “virtual worlds” if they are three-dimensional graphic spaces potentially inhabited by multiple people simultaneously via avatars. Thus, for our purposes, World of Warcraft, Second Life, and Elder Scrolls can compared to Halo, Super Smash Bros and Call of Duty: Black Ops. Television programming. Across virtual worlds, people have been creating various types of productions. First are those productions that are recorded as avatars interact with one another and then are edited in post-production for streaming. These productions are analogous to filmed drama and comedy television series. Second are those productions that live stream the avatars’ interactions as they occur, while also recording them for later streaming. These productions are analogous to the variety of live shows on television, from news to sports to special events. To be considered television programming, these productions have to be multi-part fictional or non-fictional productions that are not intended to be a feature film. The production can be either serial or episodic, and such productions represent a range of genres, including but not limited to: talk show, live performance show, design show, sports show, game show, news show, drama, and comedy. Thus far, we have identified 68 productions that met these criteria; within Linden Lab’s virtual world Second Life, at least 54 television series have been produced in the past decade and distributed by television networks analogs, such as Treet TV, Metaverse TV, and Metamix TV. Virtual world television. Many of these productions appear to follow a pattern of activities seen earlier in research on television production in collaborative virtual environments. In the United Kingdom, researchers experimented with how to use a 3-D virtual environment to produce “Inhabited Television” [2, 3]. The audience was invited into the virtual environment to participate in the content production, which was recorded and broadcast. In their virtual worlds television, the television producer defined a framework within which the audience interacted and participated to generate content: the interaction between performers and the audience was recorded to broadcast to television viewers . This production paradigm replicates a similar paradigm found across Web 2.0 technologies The idea of “build it, and let them create” is a foundational paradigm for providing the structures in which people can more actively participate in the production and distribution of content. Three television series illustrate how Second Life’s structure of user-generated design let producers create talk shows within which their audiences can creatively participate. The television series, Metanomics, was produced, distributed and exhibited in the world as well as streamed to their website since the first show on September 17, 2007 . A talk show, the producers actively invited audience members to participate in asking the guests questions during the live streaming of the show. 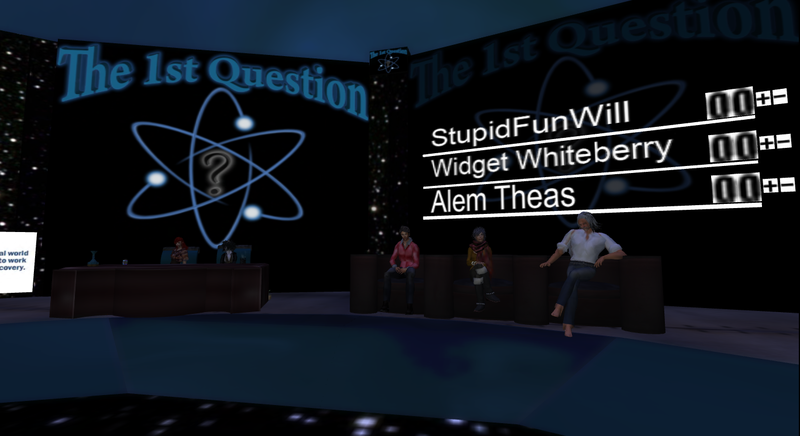 The National Public Radio series, Science Friday, owned and operated an island in Second Life to which they streamed each episode. While on the island, people could watch the show, comment on it via the text chat feature of the virtual world, and even have their questions become part of the broadcast. The series started in 1991, but did not stream inworld until August 31, 2007, just before Metanomics began. Both programs are no longer produced inworld. The final example is an ongoing series. Produced by Pooky Amsterdam, The 1st Question is a quiz show designed to test knowledge of current events, science and technology. Three contestants compete in a series of rounds, answering questions and creating neologisms, all with the assistance of the studio audience, who can text their answers to the questions and who vote for the best neologism. The program is produced at the StudioDome on the SpinDrift island in Second Life and is broadcast via Treet TV, with archives of the show available at the show’s website. Our purpose in conducting a series of case studies of virtual world television production is primarily two-fold. First, we seek to describe this phenomenon, to facilitate people’s understanding of the people, the technologyand the practices associated and involved with it, and to discuss the potentials and pitfalls of this emergent media practice and style. This illustration would be accomplished by discussing each case study from the viewpoints of the producers, crew and audiences of those specific series to illustrate what is and is not possible at this time. Second, we seek to relate this phenomenon to the discourses surrounding Web 2.0 and the dissolution of traditional television practices and relationships. To the former, the analysis would relate the people and practices of VWTV to the Web 2.0 practices and paradigms of participatory design, user-generated content, and producer-user identities. To the latter, the analysis would relate the people and practices to the traditional paradigm of television production, distribution and exhibition practices and the producer/audience dichotomous identity. We hypothesize that there will be much discussion amongst the producers on the importance of community, the lack of comparable expense, the heightened access to production tools, and the discourse of possibility as motivators for their use of these technologies for the production of television series. Selection process. We have constructed a database of VWTV series that have concluded their run or are ongoing. We gathered this database through online searches of video distribution web sites and user discussions. We sought to gather a representation from across the multitude of possible virtual worlds. The database has thus far generated over fifty series, and we will continue to develop it throughout the project. We have selected series that represent the multitude of worlds, genres and regularity of production. Each of these series have been contacted for their voluntary participation in the project. The interviews. For each series that volunteers to be considered in this project, the producers have been interviewed over the phone or Skype, asking them to discuss what led them to create the series, and their perceptions of the design, the audience, and the placement of the series in the paradigms of VWTV and traditional television. The producers also provided information as to who was on their series’ crew and what role they undertook for the series. Some crew members were contacted as asked to answer a self-interview questionnaire via email to ascertain their views on the participatory design production of the series. 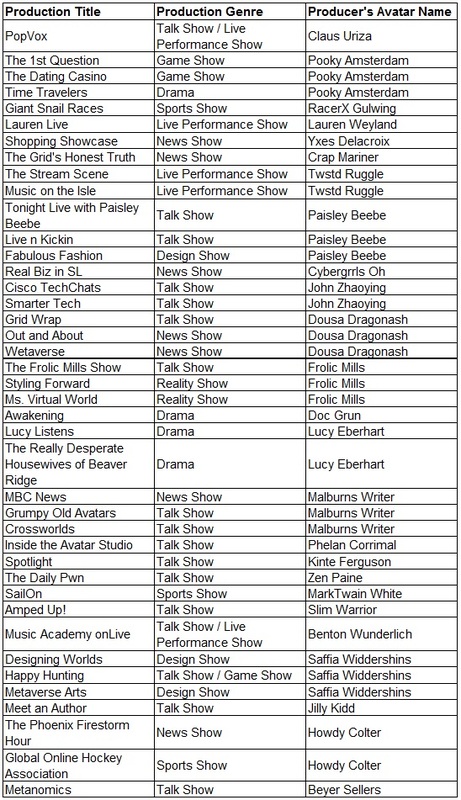 Listed in Table 1 are those productions from Second Life that have had their producers interviewed: the sample consists of 41 different series. Each series has also been labeled for its traditional television analogue. Not reported in the table is the extent to which producers have worked on or for other productions or who crewed for the various series; this aspect of the community of Second Life television will be discussed in more depth in future writings at this blog and elsewhere. Analysis of this data will be qualitative, systematically looking for common and uncommon themes in the perspectives of the producers, crew and audiences of these series. These themes will be used to address our two-fold purpose: thus there will be descriptively and theoretically driven analyses. Thus far, the main themes found in the producers’ interviews include their views on how connectivity, community, and creativity are involved in their productions, and the extent to which Second Life permits or limits these factors. Our overarching goal is to produce knowledge about who is producing VWTV, why they are doing it, and how they see the technology in relationship to traditional television. We hope to produce a monograph and multimedia online series illustrating and comparing the case studies. We believe what we learn from these case studies will provide insight into the wider phenomenon “build it, and let them create” as the paradigm continues to shape virtual and real worlds. Bell, M. W. Toward a definition of “virtual worlds”. Journal of Virtual Worlds Research, 1 1 (2008), http://jvwresearch.org. Benford, S., Greenhalgh, C., Craven, M., Walker, G., Regan, T., Morphett, J., Wyver, J. and Bowers, J. Broadcasting On-Line Social Interaction as Inhabited Television. In S. Bødker, M. Kyng, and K. Schmidt (eds.). Proceedings of the Sixth European Conference on Computer-Supported Cooperative Work. Kluwer Academic Publishers, Netherlands, 1999. Craven, M., Benford, S., Greenhalgh, C., Wyver, J., Brazier, C., Oldroyd, A., et al. Ages of avatar: Community building for inhabited television. Proceedings of the Third International Conference on Collaborative Virtual Environments. ACM Press, New York, NY, 2000. Jarrett, K. Beyond Broadcast YourselfTM: The future of YouTube. Media International Australia, 126 (2008), 133-144. Leung, L. User-generated content on the internet: An examination of gratifications, civic engagement and psychological empowerment. New Media & Society, 11 (2009), 1327-1347. Reinhard, C.D. Structuring virtual spaces as television places: Experiments in producing interactive internet television. Int’l Comm Assoc Conference (2010). Reinhard, C.D. & Amsterdam, P. The Positioning of Pooky:A semi-professional’s utilization of a virtual world for experimenting with television. 12.0 AOIR Conference (2011). Schroeder, R. Virtual worlds research: Past, present & future. Journal of Virtual Worlds Research, 1, 1 (2008), http://jvwresearch.org. Van den Bergh, J., Bruynooghe, B., Moons, J., Huypens, S., Hemmeryckz-Deleersnijder, B. & Coninx, K. Using high-level models for the creation of Staged Participatory Multimedia Events on TV. Multimedia Systems, 14, 2 (2007), 89-103.